You will be given a reference e-book to read which has 334 pages And the test will be based on that e-book , you can take final test within 1 year of purchase. It promotes faster communication because everything is based online. It allows you to quickly reach various communities especially during emergencies or any other urgent situation. It builds stronger and better relationship with target or key audiences. It enhances both the teaching and learning experience. It allows students to easily access learning materials including references, web links, reading lists and handouts. It allows presentations and tutorials that are fully based on the web. It facilitates the fast completion and submission of assignments and projects. It gives students an easier time tracking and monitoring their progress. It significantly reduces physical handouts and paper works. If you want to master the Blackboard learning system, then the Blackboard certification program which is now offered by Brainmeasures is recommended for you. The Blackboard course offered by Brainmeasures is designed in such a way that you will never find it hard to fully understand all the principles, concepts and strategies behind the system and use it to improve the quality of teaching and learning. Brainmeasures is an online certification company which has been proven to have the ability to offer all the participants of its online certification courses with the highest quality of training so enrolling in its Blackboard certification course is also a major help in getting the kind of learning which you wish to achieve. With the help of Brainmeasures, you will no longer find it difficult to explore all the basic principles in instructional design used by the Blackboard system while also understanding all the basic procedures involved in creating and organizing updated and high quality learning materials. 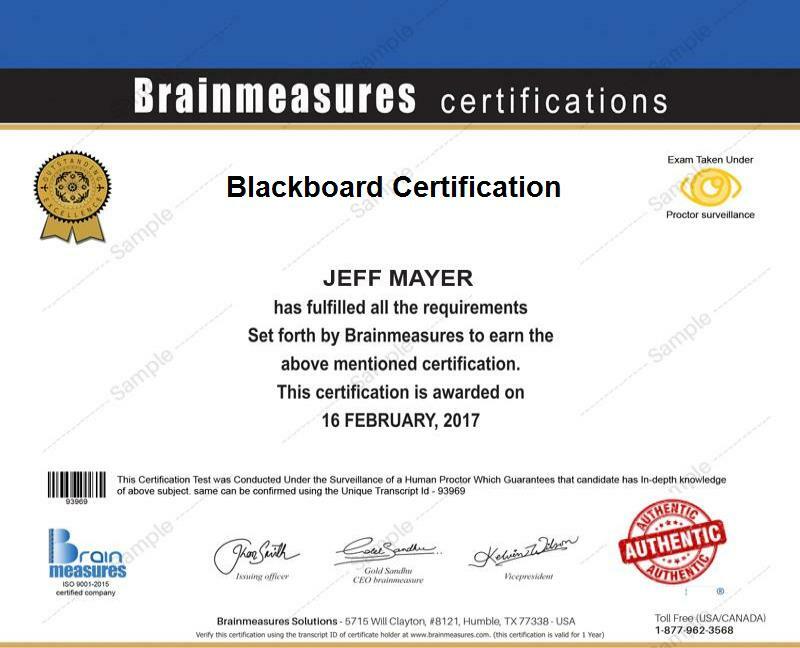 Completing the Blackboard certification course from Brainmeasures will allow you to earn your Blackboard system certificate and practice your expertise in this field. The Blackboard certification program which is now accessible at Brainmeasures can provide a lot of benefits to individuals and professionals who are serious about fully understanding the Blackboard learning system. The program is primarily designed for professionals including those who have completed an IT certification course who commit themselves towards advancing and promoting e-learning by training and supporting their students with the help of the Blackboard system. The Blackboard certification course is also perfect for support personnel, system administrators, faculty, school administrators and any other professional working in educational institutions who wish to start using more effective and faster methods when communicating to their students. Becoming an expert in the Blackboard system after completing your Blackboard certification course is extremely useful in your attempt to significantly increase your present income. If you work as a Blackboard systems engineer, then you can expect your earnings to go around $86,000 to $94,000 annually. If you work as a Blackboard system administrator, then your average salary would be $59,000 per year. If you hold a Blackboard certification and get hired in a managerial position, then you get the chance to earn around $65,000 to $121,000 annually.